From I am bored via Neatorama. From the strange-products-from-japan department comes Diet Water… the perfect weight loss beverage. 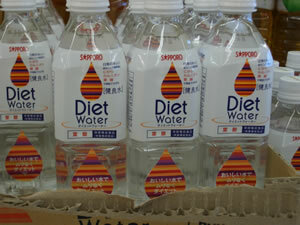 I wondered if this picture was a photoshop job – until I found another Japanese “Diet Water” product. UPDATE: Sapporo Diet Water is most definitely real – and was released way back in 2004! Well Americans certainly have their share of messed around with water. Skinny Water: This brand is a whole line of flavor enhanced 0 calorie water . 9 flavors in all and do everything from detox to energize you. Fitness Water: This water by propel is supposed to hydrate you better than regular water during your workouts. At $3/ bottle, it better do something. Mio: Then there’s all the powdered and liquid water enhancers like Mio. You simply add a squirt of flavor/ vitamins to your own water. What’s wrong with plain water? Absolutely nothing. In fact, that is the best “diet” water there is. Learning to drink and like plain water is the best way to hydrate. The western diet is full of sodium and minerals needed for electrolytes. People who say they can’t stand the taste of plain water, I challenge you to try it for a month. I’m pretty sure you’ll change your tune and save some money. There are places it tastes rank from the tap (where I used to live) and places it is delicious (where we are now) some places it tastes really dirty, and one place gave me an upset stomach for the first month or two I lived there til I went to see the dr. He said it’ll be the water you’ll get used to it so I stopped drinking it from the tap. Diet Water, it’s natural when it rains and we get litres of it in WA. Diet Water is a gimmick. Natural water is natural. There is stupids out there that read a label and think it’s fine. Natural water is fine, stupids. If anyone buy this claiming normal water is too fattening, I will have to sue them for being too stupid. Yep, stupids that think natural water is fattening. Ohhhh, really, we get ours from the heavens when it is bucketting down as we do in cyclones. No need to raid shops for fresh water, do it with the fresh rain. STUPIDS!!! Hope you stupids read this!!!! When will we get dehydrated water? Regarding Propel — $3 per bottle isn’t anywhere close to the cost. My local Sam’s Club sells a case of 24 bottles for $9.98, which works out to 41-cents per bottle. People, there’s no point in buying diet water until you are on a full regime of diet air. Pm me for details/m. Still has too many calories. Diet water? Really? How utterly stupid for anyone to buy water on the premise that it is “diet” water. But as P.T. Barnum once said, “there’s a sucker born every minute”. Nothing “detoxes” you except your liver or kidneys. Which increasing your WATER intake naturally does by way of your kidneys and liver. So therefore their claims are accurate. But it’s because of normal water not their special water. People are so gullible so they can market this way. Are you going to come out with Diet everything. Would the Diet have minus Calories. How can you make it in different flavours. I am sure a lot of people will buy this. You can sell anything to some people. i know that the water is the best slimmer.. but any one here tried it ? Why would you bother to pay for water when tap water is free & same H2o? Then why do they have Coke Lite and not Diet Coke? I’m not sure if this water will actually solve weight problem. But I can recommend diet and exercise. It sounds cliche but it is the most effective way of losing weight. Its not cliche. These techniques both reduce caloric intake and by default buidup while increasing caloric output, expenditure.